On this website, they introduce Friendship Training. There is also an interesting Dressage critique. The trainer is Chuck Mintzlaff . He is from West Germany but now lives in the United States. Anybody has ever heard of him? Here is an excerpt to give you an idea. Edited by Romy: This excerpt is from 'A dressage Critique' by Ludvik Karel 'Lee' Stane. It was NOT written by Chuck Mintzlaff but only posted on his website. Please take this into consideration when reading some of the following posts, which in that way can't be applied to Mr. Mintzlaff himself in all aspects that concern this quote. "The dressage today must be one of the most contradictory and confused riding styles of all ages. It looks like some witch brew and mixture of modern theories mixed with various old and out of date training/riding values. First and foremost, the old (classical) dressage, as well as the more modernized style of the campagne style based dressage, were to some point aimed for the use in the military of its age. Just in case you have not noticed, there is no longer any use for the "so-called" warhorses. So, the question is simple; "What are we doing when we are riding dressage and what is it about?" Well folks, you may run into many answers by the dressage participant and if you are open-minded you will see, that their justification is as corrupt and confused as the entire dressage society. Why? Well, it is so simple that even a small child would see the answer. Once, when my family and I were watching the Olympic games dressage competition, one of my children (then four years old) asked me with her innocence: "Daddy, why are the riders looking so stiff and grouchy?" I said, it is because they are, as well as their hearts are hard as stones". One would think that this may be a cruel statement, but here is a simple enlightenment. The dressage folks preach a freedom of movement and a willingness to work on the part of the horse. Well, if it so, why to hell do they need all the garbage like curb bits with brutal chin chains that increase immensely the pressure on the horse's mouth and why to hell do they need the spurs for a willing and refined horse? In the time of battle, these severe aids may have fulfilled their purpose, but in riding for a pleasure and entertainment it is down outride absurd. On top of it is the wide spread theory that one has to drive (push) his horse forward (the one that is supposed be willing to do so), just puts the toping on the cake. We cannot preserve the warhorse type of training, since the warhorse is made by the battle and not by the training alone. Hence, comparing the dressage horse to a warhorse is like saying that one is a good soldier without being "christened" by a battle. The battle makes soldiers as well as warhorses. What we have in dressage today, are mostly people who are looking for fame, money and an easy ride. The whole dressage is so corrupt, that in today's world it is nothing else but a parody of what it once was. Another example in the abuse of horses in the hands of the "dressage" people is that they started so many levels for the greenhorn rider and relatively green horses, completely forgetting that these young and green horses are incapable working in such confined areas as is the dressage ring. On one hand, they say that a ten-meter circle is for the more advanced horse, while at the same time they are asking from the young, green horse, that is not collected at all, to ride out the corners of the relatively small dressage ring. Just how stupid and contradicting is that? Oh...ok...they were talking about this guy on the Clickryder list too. He is/was Heart of Equus on NHE...he was a school member. Then, among some conversation or other, he was explaining that he had a plan to rescue his horses in case of a Tornado, I think it was. Part of the plan was to put a bit on his Stallion and lead him, with the bit, to some safe shelter. I can't remember the story exactly, but that was his demise in the school. I can't wade through his website easily. He is too wordy. It may just be a shortcoming of mine, but people who endlessly rail against the horse training world (or dog training world) and who never really get to the point (...ok, if not this, then....what?) make me crazy! I can't glean enough from endless lists of what one shouldn't do, to try and find little gems of what one should do. If he were more direct in his writing, it would be easier. But reading his website feels like endless slogging through mud so thick and deep that it's about to pull your boots off and leave you crawling though in wet socks. I already know what I do not like about the horse training world. I'm on to what I should be doing already (as many of here are)...so I can't make myself read endlessly of what I already know. Increased attention on the forehand riding, the disqualification of riders that fail to meet the collection level as well as the balanced level in the appropriate dressage class (0 points!). I think he's referring to having a head too low....but it's hard to tell. And I can't tell if he means that forehand riding is good or bad. Maybe bad. He just isn't clear enough. The quote says he really doesn't understand or studied the so called "war" dressage at all. So his statements are as thin as air... you can't rage against something you don't know anything about. "War dressage" is woven into Classical Dressage and part of ancient history. It boils down to traditions wich are kept alive at the 4 big Haute Ecole's in Europe. To make the jump from this to modern dressage only by comparing bits and spurs just says this person wants to display an anger towards a big group of riders, just for the sake of it. If I look at the people at this forum, this are open minded people. 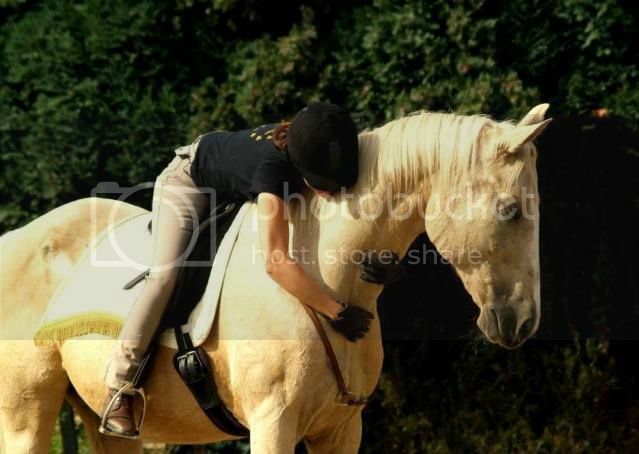 I think you have to be open minded and positive to be the best friend to eachother and your horse. I don't believe in taking all your frustrating thoughts about others and turn this into a theory about friendship. This has nothing to do with this. Friendship is about person to (horse, human, animal,-)person and nothing else matters. Madeleine, I hope you didn't think anything I said was directed at you...I thank you very much for sharing the website! All I said was directed at the website itself! oh no nothing about Madeleine, my comments too are only about the person behind the quote. I think he's got some excellent points. I always take up the discussion about the bits, which were so neccesary for a warhorse as they say. Then I remind the people indeed, that there is no war going at the present in which we need to fight with our brave steed to safe our lives. So... why do we need bits still? This bitterness in him shall probably pass, maybe you should point him out to this forum? He is ever so welcome! Don't worry I did not take it personally at all and I welcomed your comments. I am often naively enthusiastic when it comes to new training methods based on kindness. This is the reason I asked for input and opinions from the horse people I respect the most: the administrators and members of this forum. Thank you for taking the time to post your very pertinent comments. As far as war, wasn't it the Mongols who had such a great cavalry and rode with little tack on ugly ponies? OK, that may not be totally accurate, but does anyone no more about what I'm talking about than I do??? Thanks for this topic! I just found what FT means (from a message into Alternative_horses Yahoo group), and I was exploring the relationship betweeen FT, NHE and AND. This discussion will save much of my time! The problem is: are we discovering something new, or - as a friend of mine, Piciopacio, into his "personal forum" says - we are simply re-discovering again and again, with lots of unuseful enthusiasm, something written into Old Masters books? How much "innovation" in horse training is really innovative? Yes, you're right... and heart ... simply heart is almost impossible to teach. Even if we're rediscovering something, then that's great and it's something we can and should be enthusiastic about. Because we can only rediscover because it was lost in the first place. You can't rediscover the roll-kur, because all around us horses are ridden like that. And then there's the question how much is rediscovery, and how much is a new twist to old knowledge? Yes, ages before us people were riding without bridles too. And yes, classical dressage masters had loose hanging reins as their goal. But have those two pieces, training without bridle and training for collection, ever been put together to form this exact picture that we're laying down right here, right now? And yes, I remember Heart of Equus from the NHE forum too. His posts tended to be somewhat hard to get through, indeed because you can only be so much against something before your reader needs to see what you're for too. I thought it was annoying that he didn't tell what his ideas were, only what he was against, but that doesn't mean that he can't inspire others. I kept reading his website and I like this approach of horse buddies. Equine friendship (commonly referred to as horse buddies) is a very special relationship between two horses. It is so special, they do not share this level of intimacy with any other horses in the herd. In this relationship, intimidation, pressure, force, comfort/discomfort and physical punishment are never needed or used. Both horses completely accept the herd rank of their trusted friend. The higher ranked horse never worries that his lower ranked friend might challenge him or take advantage of their trust and friendship. The lower ranked horse never worries that his higher ranked friend will take advantage of him or hurt him. In short, it is the exact opposite of the normal herd relationship (and that of traditional training) in that it is a very trusting, codependent, harmonious partnership shared only between two horses. But these intimate equine friendships do not just â€œhappen.â€ They evolve over a period of time in very specific, sequential stages. By duplicating those same steps and situational environment, anyone can enjoy the benefits of that same intimate relationship with any horse, regardless of their age, gender or previous life experiences. I like the idea but it is the first time I hear of such a thing as horse buddies in a herd. I have always looked at a herd as an environment of dominant ranking challenges for all horses. Has any of you been able to make this kind of observaton between 2 horses in their herd.